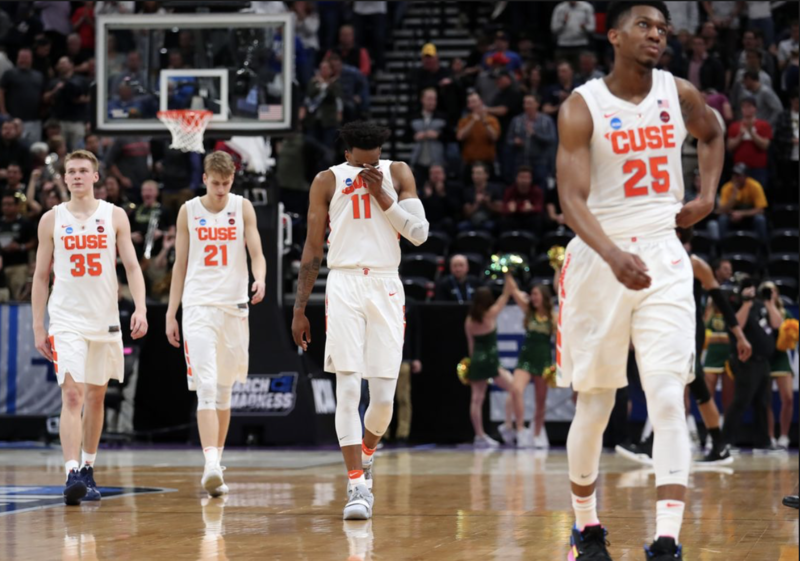 Syracuse will hurt far more from its departures heading into the 2019-2020 season than it did coming into this past one. With Tyus Battle NBA bound, Frank Howard and Paschal Chukwu are graduating, and there is also no guarantee that Oshae Brissett will be back either. Because of how much more painful the departures after this season are as opposed to last, it’s fair to say the spotlight on this year’s incoming freshman class should be bright. Heading into this past season, SU’s Class of 2019 was added to a team whose biggest losses were Matthew Moyer, Braeden Bayer and Geno Thorpe (who only played in six games). Sure, Syracuse fans were excited for the arrivals of Jalen Carey and the athletic Robert Braswell. They also embraced the lure of Buddy coming to play for his pops, and rightfully so. However, that class of recruits wasn’t playing for a team looking to fill voids left by players like Battle, Howard, Chukwu and if Brissett goes, him too. And yes, the Orange was dealt a blow when Darius Bazley de-committed, but we’re talking about losing Tyus Battle here – a much bigger blow than someone who never even played for the team. Along with Carey and Buddy, the Orange may very well need some freshman production in trying to fill the sizeable voids left in its backcourt by Battle and Howard. Carey will presumably start at the point and Boeheim will be counted on to hit threes as a shooting guard, but Goodine and Girard may certainly be needed to step up in ways most of the previous freshman class had not necessarily been asked to do. It seems unlikely that the gaping hole Battle and Howard leave behind will be successfully filled by just two players – two young players at that. As a result, Goodine, an athletic player and adequate shooter, could perhaps see some decent time. The same goes for incoming sharpshooter Joe Girard, who will face competition considerably superior to what he saw while breaking records in high school. Additionally, with Chukwu no longer in the fold, Syracuse really only returns Bourama Sidibe at the center position. That’s why the addition of Ajak could come in handy – especially if he can develop a polished jump shot. The 6-foot-11 product from Kenya (after being born in South Sudan) started playing basketball just four years ago and is still rather raw, however, with no more Chukwu, it might not take long for Ajak to get his feet wet. There’s also Guerrier, who might get the chance to contribute in multiple areas. At 6-foot-7, Guerrier, who shoots the ball well, typically takes the floor as a small forward, but can also man a guard spot. That could help the Orange in its quest to fill backcourt vacancies, but Guerrier may also be useful in the frontcourt. Also, a native from Canada, the Thetford Academy product has been compared by many to current Syracuse forward Oshae Brissett. If those comparisons are even remotely accurate, Guerrier’s impact as a freshman could hinge on Brissett’s future in a Syracuse uniform – if Brissett decides to enter the draft, it could spell some solid time for Guerrier at the small forward spot in 2019-2020. Overall, it seems rather likely that the four incoming players in the Class of 2019 enter their freshman seasons more needed than the ones who came in last year – at least in regards to making immediate impacts. That shouldn’t come as a surprise, however. It’s not as if any of last year’s incoming freshmen were going to take time away from guys like Battle, Howard or Chukwu. But those key cogs are gone now, making this year’s incoming class extremely important. It should certainly be noted that while this incoming group may be more important as freshmen than last year’s class was, next season’s team will not amount to much (if anything at all) without production from its members of the Class of 2018 as well. Alongside key returners Elijah Hughes and Marek Dolezaj, sophomores Jalen Carey and Buddy Boeheim will be integral parts in maintaining program prestige in the post-Tyus Battle era. Some of these guys like Girard will probably redshirt, maybe even Akok. Buddy should come off the bench and move Hughes to the 2. My vote is Braswell at the 3. Shoots well, has good defensive instincts and understands the 2/3 from what limited play I saw. Guerrier coming off the bench. Personally, if JB doesn’t go back to his old style of coaching, we’ll be a bottom feeder in the ACC. He dropped the ball this yr., players regressed and he seemed to believe his own headlines and now after the revelation of Howard’s drug use, I hope Tyus wasn’t also involved. His MIA’s of the 2nd half of conference games was inexplicable.